You feel the need to upgrade your laptop and purchase something better, but you’re stuck with the question of which would be the best laptop 2019. There are many options, and many categories: Chromebooks, business laptops, consumer laptops. So which should you get? In brief, a consumer laptop is the common one, it’s halfway between a Chromebook and a business laptop in terms of features, durability and price. While Chromebooks are shorter on features than consumer ones, they’re more suitable for a low or limited budget. While business laptops may be the most expensive, they are the most solid. With more battery life and way more features than consumer laptops or Chromebooks, but of course that’s if you can put the dollars in them. In the following guide, a variety of laptops and Chromebooks are listed with a summary of their performance to help you make your choice. The Dell XPS 13’s features are packed into a compact size, where you get 13.3 inches of display on an 11 inches frame. Its bezel only 5.2 mm thing, and its weight 2.7 pounds. It has an amazing Ultrasharp QHD+ resolution (3200 x 1800) with 5.7 million pixels to bring out every small detail of your content. The IGZO IPS panel allows you to see content with clarity from about any angle with the 170-degree wide-viewing angle. The outdoor’s brightness doesn’t affect the visibility of your screen as the Dell XPS 13 comes with 400 nit brightness, which is more than a typical laptop screen. All of these options are integrated in a touch-friendly screen so you can tap, swipe, or pinch through your content. The Dell XPS 13’s performance is enhanced with the new 8th generation Intel processors with 4 cores so you can multitask with no lag. With the aid of Dynamic Power Mode you get extra processing power, milking your CPU’s power for all its worth while simultaneously keeping track of the system’s temperature. With the 2 combined you get 44% improved performance over the 7th generation processors. The battery life lasts you all day long when you’re using it for productivity like Word or Excel, with an astounding 22 hours of use on an FHD model, 13 hours when streaming movies or shows. And if you have the optional Dell Power Companion you get an additional 11 hours and 30 minutes. The Thunderbolt 3 Type-C port allows you to charge your laptop and connect other devices, as well as enjoy data transfers up to 40 Gbps. Your connectivity is increased with the 1535 Wireless-AC adapter that provides the most stable connection to give you an uninterrupted experience. Furthermore, the functionality of the Dell XPS 13 is boosted with the accuracy of the touch commands so you don’t have to deal with the hassle of jumping and floating cursors, while Accidental Activation Prevention doesn’t let unintentional clicks follow through when you click the touchpad with the palm of your hand. You don’t have to worry about typing in the dark as the keyboard is backlit and illuminates the keys for you. And finally, you don’t have to worry about memorizing your laptop’s password because Microsoft Hello has you secured, where you can unlock your device using your fingerprint, face, or iris. What is more safeguarding than that! Last but not least, the Dell XPS 13’s construction is of utmost brilliance as you get maximum durability with its sturdy, sustainable chassis, and Corning Gorilla Glass NBT touch display which is up to 10 times more scratch resistant than soda lime glass. Its palm rests are made from carbon fiber to provide strength with thinness of aluminum, while being lighter and cooler to the touch. The Dell XPS 13 slowly adopts new technology to deliver a brilliant, high end experience. For anyone who needs a 13-inch laptop, XPS 13 is the best laptop in 2019 for him. 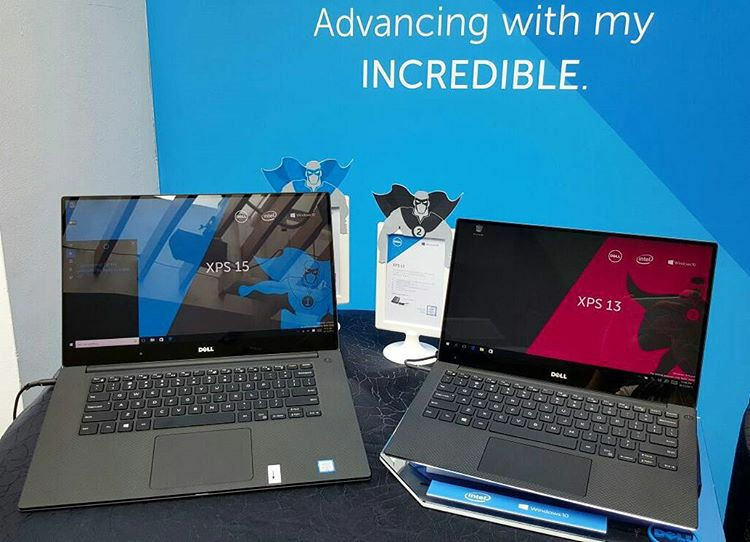 The Dell XPS 15 provides a 15.6 inches screen on the smallest size possible, with Infinity Edge display, it almost looks borderless and maximizes screen space, thanks to a bezel measuring just 5.7 mm. The Dell XPS 15 also has Ultrasharp 4K Ultra HD display (3840 x 2160), you can see each detail of every pixel without even zooming in! It has 6 million more pixels than Full HD and 3 million more than MacBook Pro, so you can edit images with great precision with no regard for blurriness or jagged lines. Furthermore, there is easy collaboration providing a wide viewing angle of up to 170 degrees. You can get super-speed with the latest 7th generation Intel Quad Core processors and optional 4GB GeForce GTX 1050 graphics card. It supports up to 32GB of memory, and expandable storage up to 1TB. The astonishing battery life lasts up to 19.5 hours when used for productivity like using Word or Excel, while it lasts up to 11.5 hours when used for streaming movies and shows. You can get an additional 9 hours of productivity for your laptop if you get the optional Dell Power Companion. The Thunderbolt 3 port allows you to charge your laptop, connect to multiple devices (including support for up to two 4K displays) and transfer data up to 40 GB/s which is faster than USB 3.0. And it also includes two USB 3.0 ports. Pinch, zoom and click through the interactive and accurate touchpad that prevents jumping and floating cursors. It also has Accidental Activation Prevention which doesn’t allow palm touches to activate the touchpad, so you don’t mess up that article or essay you’re writing, or stop the video or presentation you’re watching, or at worse: close the window you have open unintentionally. You can log in with no password with the optional fingerprint reader which gives you a secure way to quickly unlock your device. Relatively compact, the Dell XPS 15 offers both great gaming and working experiences, at an affordable price, with a powerful vivid 4K screen display. Designed with a single block of aluminum and precise computer controlled process, it is very compact in size where every inch is put to work, giving you a sleek, ultra-thin and lightweight device. There’s an amazing security option, where you can press F1 to activate privacy mode, making your screen appear dark to everyone but you, securing your confidential data. You can log into your device in any mode with a simple touch of your finger upon the fingerprint reader. With an 88 degree wide-angle field of view in the HP wide vision FHD IR camera, you can log in safely through Windows Help and video chat with your friends and family. You can use your HP Spectre x360 in multiple modes: laptop mode to browse your projects, e-mails, spreadsheets to multi-task with a backlit keyboard and extra-wide trackpad. Tablet to take notes and draw with the pen that feels as natural as a pen on paper. Stand to watch, which is perfect for streaming videos and shows. And finally, tent which is ideal for giving presentations or sharing photos. With up to 16 GB high memory capacity which helps provide optimum multitasking experience, and you can also charge your phone, tablet, and other devices from your laptop while it’s asleep or hibernating. The HP Spectre x360 includes an 8th generation Intel Core i5/i7 processor, which facilitates multitasking and improves speed. SSD storage is available in capacities up to 1TB. The Battery life is astounding with 16 hours and 45 minutes on the 13.3 inches Spectre x360 and 12 hours and 45 minutes on the 15.6 inches Spectre x360, so you can spend your whole day without worrying about recharging. A stylish design combined with a super-slim build, amazing 4K display and high speed, the latest version of the HP Spectre x360 makes it as an ideal high-end convertible laptop. You can use The Microsoft Surface Pro in laptop mode, with the built-in Kickstand, and adding the new Surface Pro Signature Type Cover, designed with top notch Alcantara material and a responsive keyboard. In studio mode, by lowering the Kickstand and with the next-generation hinge that has more depth, you can place the Surface Pro in studio mode for the best angle to write or draw using the new Surface Pro Pen. Or finally, in the tablet mode, by closing the Kickstand and removing or folding Surface Pro Signature Type Cover back for a strong, stand-alone Intel tablet. It’s like having three devices in one! The Microsoft Surface Pro boasts battery life to 50% more than Surface Pro 4, 2.5 times better performance than Surface Pro 3, and fastest startup and resume of any Surface pro so far. It offers up to 13.5 hours of battery life, RAM size 16 GB, and an astounding 1TB, 512 GB, 256 GB or 128 GB of storage. The vivid display gives you the motivation to work and be creative, as you watch your ideas come to life in amazing colors and sharp resolution on the 12.3 inches PixelSense display. Improved hybrid cooling on the i7 model gives you extra quietness while you work, and still on the m3 or i5 models you get fanless cooling systems that do not cause headache while you’re busy working, studying, or doing preparations. With dimensions 11.5 x 7.9 x 0.33 inches you can create, study, work, and play anywhere. Its light 1.7 lbs. weight makes it quite portable, and the soft rounded edges help its portability. With better performance, longer battery life, and other improvements over its forerunners, the Microsoft Surface Pro holds a position for 2-in-1 windows tablets. You can choose what color your Apple MacBook Pro comes in, whether silver or space gray. The MacBook Pro runs on a strong processor that can be 2.6 GHz 6 core Intel Core i7, and the turbo boost powers it up to 4.3 GHz respectively, and 6 MB or 8 MB shared L3 cache respectively. Your charging is supported by four Thunderbolt 3 USB-C ports, which allows you a data transfer speed of 40 GB per second. The 4.2 wireless Bluetooth and 802.11ac Wi-Fi wireless networking together extend your connectivity options greatly. And finally, enjoy 10 whole hours of uninterrupted use, so you can concentrate on whatever task you have on your hand. The standby time is up to 30 days. If you’re looking for a creative experience, the Apple MacBook Pro would make a very enjoyable product for you. It’s the top of the high-end laptops & best laptop 2019 for Apple users. The Lenovo ThinkPad T470 offers excellent performance with the 7th generation Intel core i5 processor, 8 GB RAM, and 32 GB of storage space. It also has ultra-fast SSD storage, as its drive has no moving parts and performs faster, boosting speed up to 3 times, opening files 30% quicker, and transferring files at around 200 MB/s compared to 50-120 MB/s. Add to that, it is quieter, more reliable, and has more security. The Lenovo ThinkPad T470 is easy to set up and quick to service, upgrade and secure. It can be used by everyday users or IT technicians as it was designed to get everyone through life and work easily. Moreover, there’s Windows Hello’s advanced fingerprint technology available to save you lest you forget your password. With a simple touch, you can log in, fast and securely. The ThinkPad T470 comes with Intel Thunderbolt 3, the technology that brings lightning-fast Thunderbolt to USB-C at speed up to 40 GB/s. This gives you four times the data and twice the video bandwidth of any other port type, all while supplying power. This gives you Thunderbolt, USB-C, and DisplayPort. Not only that, but you can also output to two 4K displays with Thunderbolt Dock. The Lenovo ThinkPad T470 comes with two batteries and Power Bridge technology, so it gives you flexibility and up to 18 hours of battery life on a single charge. It has 4G connectivity, so you can still access all your cloud data and apps if you’re not in the range of Wi-Fi. It also has an HD camera and dual-array microphones with background noise reduction for perfect voice and video calls. With the award-winning economic ThinkPad keyboard mixed with its refined TrackPad and TrackPoint, rest-assured you’re going to find your performance smoother, cleaner, and more accurate. Generally, the Lenovo ThinkPad T470 is a good choice because it combines a set of good features and top-notch technology, but it could cost more than the average business laptop. And it’s considered as the best laptop 2019 for business. The Acer Predator Helios 300 is designed to suit your gaming wants and let you take on challenges, and its style pretty much says it. Its textured metal frame comes in a black and red color, and the keyboard is backlit with red light. Its 15.6 x 17 inch screen size with Full HD IPS gives you a nice immersive gaming experience. It has a an all-metal ultra-thin (0.1 mm) AeroBlade 3D fan that provides advanced aerodynamics and superior airflow, as well as a dual-fan cooling system which is custom-engineered for your gaming needs. The awesome design is shown both from the front side with its flat, geometric angles and the hard edges that accents its bold black and red colors, and the back side with its exhaust vents that get rid of heat and emphasize the bold look. When it comes to superior operation, the Acer Predator Helios 300 beats the high scores with the latest 7th generation Intel Core with i7 processor and over-lockable NVIDIA GeForce GTX 1060 graphics. It comes with the NVIDIA Pascal architecture and upgraded gaming technologies that makes the Acer Predator Helios 300 the ideal choice to run your high-definition games. The Predator Sense gives you an overlocking feature to give your gaming sessions extra fuel. Though you could find similar components for a smaller price, the Acer Predator Helios 300 offers a lot of unique features, combined with a big screen, with an average price and the best value laptop in 2019 for gaming. The Asus ZenBook UX330UA comes in a sturdy aluminum-alloy chassis that is as thin as 13.5mm and weighs 2.6 pounds. Its battery lasts 12 hours so it can accompany you all day along since it’s not the common lithium-ion but a lithium polymer one, which has a much-enhanced lifespan. Not only that but it retains most of its original charge capacity even after years of charge cycles, so you don’t have to worry about the performance of the battery deteriorating. The screen gives you a stunning 3200 x 1800 QHD+ resolution on in a 13.3 frame, so you can enjoy comfort and efficiency whether you’re reading, working, or simply watching a movie. You can see every small detail with crystal-clear sharpness with an amazing pixel density of 276 pixels per inch. The Asus ZenBook UX330UA features a very wide color gamut plus ASUS Splendid technology which means that it’s capable of displaying more colors which are more accurate and more vivid than any other display. Add that to its wide viewing angle technology that extends up to 178 degrees, the colors and contrast remain intact. Moreover, it has four one-click modes: a normal mode which gives you the standard factory settings. The Eye Care that reduces blue light levels for up to 30% for viewing comfort, as that blue light produced by LCD screens is said to have an impact on eye health. The Vivid Mode to enhance images and make them more vibrant and vivid without compromising the colors and making them look artificial. And finally, the Manual mode which gives you control over the color temperature setting, so you can manually fix them to suit your own preferences. The Asus ZenBook UX330UA offers great connectivity as it’s equipped with the new reversible USB-C port that connects devices easily and provides data transfers up to 10 times faster than the older USB 2.0 connections. It also has 2 USB 3.0 ports, a micro HDMI port, and an SD card slot, so you can connect as many devices as you please. You can also stay connected to the Internet with the super-fast 802.11ac Wi-Fi, which is up to 2.8 times faster than the old 802.11 b/g/n. As well as with the Bluetooth 4.1 lets you connect your devices with less impact on battery life. You can get its sleek and stylish design in two colors: Quartz grey or rose gold. The Asus ZenBook UX330UA delivers incredible performance with a good battery life, extreme portability and all at quite an affordable price. And considered as the best laptop 2019 for the money. The Acer Aspire E 15 comes in many models, all of which have beautiful designs, function better, and have phenomenal effects. It has a variety of colors with smooth metallic textile patterns, and the additional edge highlights enhance the stylish look of the device and accentuates its design. The Acer Aspire E 15 comes with a 6th generation Intel Core i5 processor and runs on Windows 10 Home with turbo boost technology that makes it go all the way from 2.3 GHz to 2.8 GHz. With a 15.6 inches widescreen with Comfy View LED-backlit display (1920 x 1080 resolution and 16:9 aspect ratio) which supports the Acer Color Blast technology. With a combination of quicker wireless networking, DDR4 system memory of high speed, strong NVIDIA GeForce GTX 950M (GDDR5) graphics and support for the new reversible USB Type-C standard. Moreover, battery life lasts with you up until 12 hours. Its touchpad acts out touch commands like pinching, swiping or clicking with a high level of precision as though on a touch screen. With the support for Windows 10 you can use the help of Cortana the brilliant assistant to navigate through programs or bring up the Action Center. You get a better media experience with the additional enhancements, like Acer True Harmony that gives you audio that resembles lifelike sounds from the two built-in stereo speakers, and Acer ExaColor that delivers ideal color accuracy and uninterrupted audio and visual with components that are Skype-certified. The Acer Aspire E 15 offers great features at a very affordable price, including a lathe high quality screen, top notch perform, and battery life that is excellent for its class & considered as the best budget laptop in 2019. Get a stylish and compact design, a 16:9 wide-viewing angle, and 1920 x 1080 FHD display in the awesome Asus Chromebook Flip C302CA. Enjoy a sturdy all-metal body, made out of durable aluminum and built to withstand practically anything. The unique 360-degree hinge lets you use the Asus Chromebook Flip C302CA in a variety of ways: as laptop, tablet, stand mode, or tent mode. The 12.5 inches full HD wide-viewing angle screen makes it ideal for groups, as everyone can see the content meant to be shared. A built-in light sensor automatically adjusts the brightness of the screen to contrast the brightness of the room, so that you’re not distracted by having to adjust it to battle the reflections on the screen, or inability to see due to a dim-lit screen. With 10 points multi-touch, it is more accurate and responsive than the average screens, so your experience with the Chromebook will be enhanced, as it makes it fun and easy to use. The full-size one-piece chiclet keyboard has improved back assembly and provides 1.4mm of key travel and minimal key float, so you can type smoother and with more precision. The touchpad is 104.5 x 61 mm wide, and it has palm rejection to prevent any accidental movement by unintentional touching. The Asus Chromebook Flip C302CA runs on a 6th generation Intel Core M3 processor and supports up to 4 GB DRAM. It also has 64 GB of storage. It runs programs and apps very smoothly and turns on immediately. You can get data transfers up to 5 GB per second while keeping backward compatibility completely intact through the 2 USB-C ports located on the side of the device. The Bluetooth 4.0 and 802.11ac Wi-Fi –which is 3 times faster than the 802.11n- together allow you to stay connected to the world around you. With a single charge, the Asus Chromebook Flip C302CA lasts up to 10 hours, which gives you a great deal of time to finish all the work and tasks you have. Mix that with the light weight of less than 2.65 lbs. and its 13.7 mm thinness –which make up for great portability-, you can take it with you anywhere to finish your tasks on the run. The hinge, touchscreen, and support for Google Apps makes the Asus Chromebook Flip C302CA a great choice with the variety of options it has to offer.Finally, The C302CA comes as the best laptop 2019 in the chromebooks category. Generally, what I think of as the best laptop for 2019 is the Dell XPS 13 as it’s the best laptop overall. Seeing as its only drawback can be considered the webcam position, and the compensation for this minor inconvenience by overwhelmingly amazing features, who can turn it down? Offering 44% improved performance with the new 8th generation Intel processors with 4 cores and Dynamic Power mode. Its longest battery life is quite impressive, which is 22 hours of use. So it offers the whole package and a at a very affordable price range as well. My guide has included several products of several categories, from business laptops, consumer laptops to Chromebooks. Now we have gone over basic differences in the introduction but in our buyer’s guide we’ll get into more details and assess everything step by step. First things first, I’ll list each type with what you could be looking for when making your purchase. Chromebooks: You should consider a Chromebook if you want to meet halfway between good features and an affordable price. Chromebooks are quite low-budget devices, but still give you a wide variety of services and accomplish many tasks a consumer laptop would. Consumer laptops: You should consider a consumer laptop if you can spend a bit more, and want better features and more precise performance. Business laptops: You should consider buying a business laptop if you intended on using it for work. Long battery lives, and strong, premium build qualities that are durable are very redeeming qualities of a business laptop, and explain where it gets its name: you get the job done using it. Laptops whether consumer or business run on the common Windows operating system we all know, while Chromebooks run on Google’s Chrome OS, which can be described as a Chrome browser designed to look a little like the Windows desktop. There’s a search button similar to the Window’s start button that’s located on the lower left corner in a taskbar. On the lower right corner there’s a status bar with access to Wi-Fi, Bluetooth, volume and settings. Chromebooks are generally lighter in weight, have lower-end parts than laptops but still give quick performance, and even install updates automatically. Cortana in Windows 10 is more versatile than Chrome OS’ Google now, however, Google Now is more specific and gives more information about the subject that you’re inquiring about. Everyone installs programs to suit their needs and how they want to use their devices. You can do that on both Windows laptops and Chromebooks, but the possibility that a Chromebook wouldn’t support it is higher because Google’s OS is a browser, so if you run a program or play a game through a website, you can use it through Chrome. Even though you can’t download programs, there’s a decent variety of apps, but if Adobe Flash or a dedicated plugin are required to run something you won’t be able to run it. Chromebooks are beginning to get access to Android Apps, which widens the options you have to choose from. Chrome is a great browser and is very easy to use with a friendly interface, but you might not enjoy the fact that if you own a Chromebook, you can’t get any alternatives. The Chrome browser cannot run Flash or Java, which means you will get some compatibility problems when trying to view certain websites or run extensions. On the other hand, a Windows laptop can run any browser you would like to use. Windows also developed a new browser, Edge, which has some features that are not offered by any other browser, like the ability to write directly on websites and share these writings with others, Cortana search on the same page, and reading mode that removes irritating elements like ads as well as saves articles so you can view them offline. On Windows, you get the traditional and familiar folder of files that appear in the simple File Explorer program. You can save files to your desktop, pin documents to the bar, and create or delete folders. You can also access Microsoft OneDrive files. On Chrome OS, you get a File folder in the main menu as well, but it’s not in the start many by default like on Windows. You can access Google Drive files or any others that have been downloaded to the storage drive. However, the amount of storage space you get on a Chromebook is likely less than that of the Window’s OS. Some business use software that is compatible only with Windows, like AutoCAD design that can’t be run on a Chromebook. Microsoft’s own Office suite, including Word, Excel and PowerPoint, is also a very important factor in this comparison. You can still use them on Chromebooks but in the web version, which might not be as smooth. There are alternatives for Chrome OS, but most of them require a working internet connection to work. Viruses, malware, and keyloggers have been known to infect PCs for so long, that’s why the first thing Windows users must do is install an Antivirus program though they do come with Microsoft’s Windows Defender which notifies you of any viruses, or when it doesn’t recognize an app to help prevent phishing attacks. To expand the security to hardware as well as software, Microsoft is enabling Windows Hello to unlock devices by using fingerprint scanners, or by using your face if you have an Intel RealSense camera. On the other hand, a Chromebook comes with its security built-in. It automatically checks for and applies security update. And though the inability to run Flash can be a drawback, there’s an advantage to it, which is that you won’t be getting the security issues surrounding it. Restoring factory settings on a Chromebook can be done with a couple of click on the mouse pad. Windows laptops come with more variety of technically everything. Screens that vary from 11 to 18 inches as opposed to Chromebooks’ 11 to 15 –with smaller than 15-, to the storage space that ranges from 2 GB to 16 GB to 1 TB, as well as the build material: some laptops are plastic and others are metal. Let alone the fact that some can be used mainly for business-oriented tasks and other can be used for gaming or general productivity. The Chromebook market is smaller but growing steadily. Their distinctive quality is their portability, as they weight around 2 to 4 pounds. But when it comes to variation, the Chromebook market is quite very limited. Windows laptops used to cost more than Chromebooks, but Microsoft has worked, and succeeded, on bridging that gap. Entry-level laptops can be very close in price to Chromebooks, but still offer a wider variety of options. So finally, we can say that if you’re looking for a low-budget device that you can use mildly, a Chromebook is quite a suitable choice. But if you’re looking for durability and efficiency, you should be considering a laptop, whether a business or consumer one. Read more: Laptopmag Buying Guide. Laptopunboxed.com is a participant in the Amazon Services LLC Associates Program, and we get a commission on purchases made through our links.